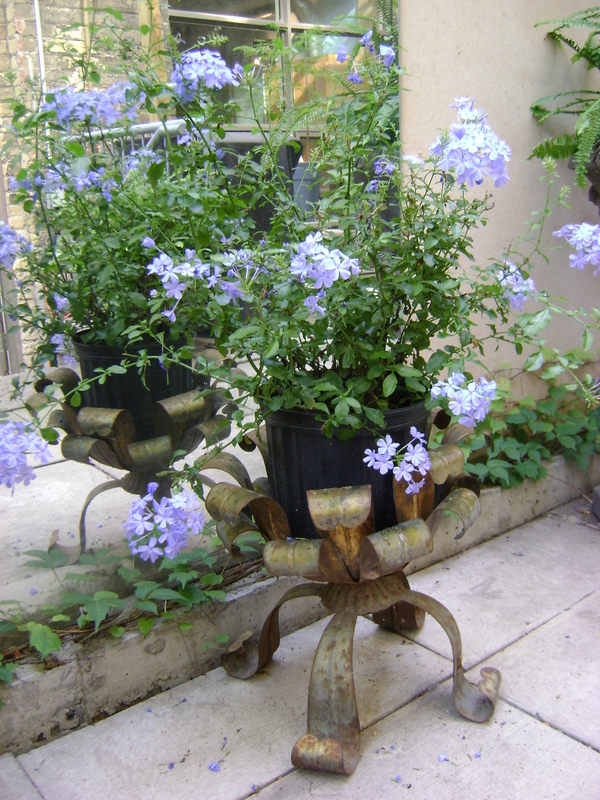 What can I say about plumbago? It is such a delicious colour, a pale powdery blue. A dear friend of mine gave me one for my birthday, that was the first week of June and it has not been out of flower since. I keep it on my terrace in Toronto, as I am not in the country enough to be able to water it on a regular basis. I was a bit worried I would not have enough light to keep it in flower, the terrace only gets morning sun, but look at it! It can grow to be quite a large shrub, if you live somewhere there is no frost, I will have to bring it inside for the winter. It flowers on new wood, so I can cut it back quite heavily to keep it in shape. 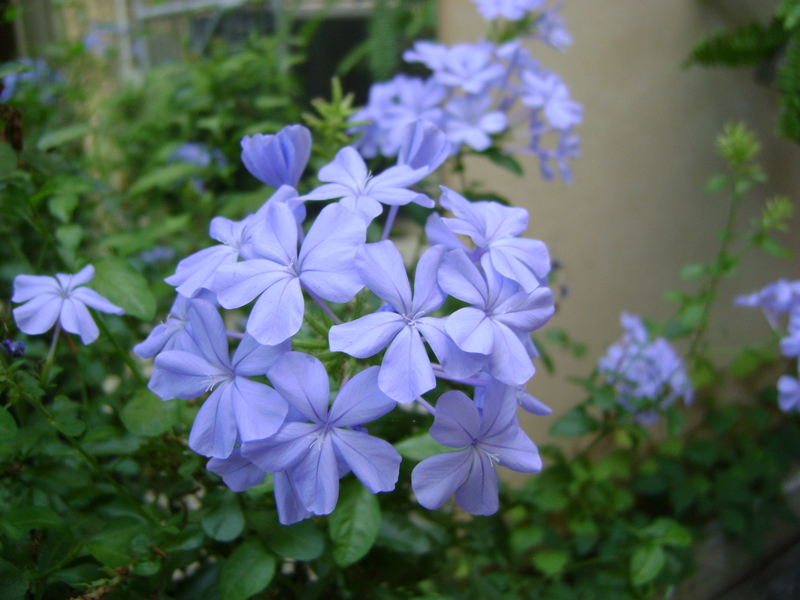 When I was researching the Plumbago, I was looking for a common name for the plant. I have always known it as Plumbago auriculata, but there are quite a few common names, however the one that I felt described it the best was Skyflower. It does look like a little bit of sky fell down and landed. Unlike a lot of gardeners, I cannot get outside in the winter and garden, boo hoo! I am forced to have some house plants if I want to smell earth and get my hands in the soil this time of year. However, I am not big on house plants, sacrilege I know, especially as I am a floral designer. We sell house plants and I have to be positive about them. I just find that I am too busy in the summer gardening, to take care of them. And driving back and forth between two homes does not help, did I remember to water them before I left for the week? It drives me crazy. So I do not have any, perhaps when I am settled in one house I will get some, but right now, nothing. Except orchids. I find that orchids are undemanding, at least phalaenopsis,or moth orchid which is the only variety I have in my home. They can take a lot of neglect, most of our customers kill them by overwatering them, or letting them stand in water, they hate that. A general guideline is to water once a week in the winter and twice a week in the summer. They like bright light but no direct sun and average temperatures, if it is comfortable for you, it is perfect for them. There are so many beautiful colours of phalos besides the classic white. Here is another. What an amazing colour! When they are finished flowering do not cut the stem off at the ground. If you do this it takes forever for them to flower again. Orchid growers tell you to cut back the stem, to just above the second node, but I never do that. I find mine send out a side flowering shoot rom the main stem, near the top. Probably the plant would have a neater look if I did cut them back, but I am too lazy to do this, and they still flower for me. A temperature fluctuation of 10-15 degrees Fahrenheit, is the key for them to set a flower spike. They should be fertilized once per month with an orchid fertilizer. Repotting is around every two years, you’ll know they need done when there is a large number of roots hanging outside the pot. Phalaenopsis orchids are so inexpensive now, please try one, you will be glad you did.